Bringing a new kitten home is one of the most exciting events in life. You’ve planned, purchased provisions and are eager to start sharing your home with a new, cuddly companion. Learning healthy feeding habits is one of the most important lessons for a new kitten and guardian. Whether this is your first or fourteenth feline, these basics will help make your kitten’s mealtimes as nourishing as possible. Nutrition during the first nine to twelve months of your kitten’s life is critical for proper growth and development. Before you bring a new kitten into your home, talk with your veterinarian about selecting the best kitten growth formula. Growing cats require a careful balance of about 40 essential nutrients for optimal nutrition. 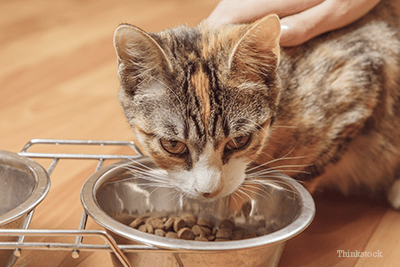 The National Research Council (NRC) and American Association of Feed Control Officers (AAFCO) have established kitten nutrient guidelines for pet food manufacturers. Most kitten formulations will have higher calories, protein and fat than adult foods—along with nutritional additives to enhance development. There are more fantastic and wholesome diet choices than ever before. Find out your veterinarian’s food philosophy, review your own beliefs/lifestyle and work together to create the individualized feeding plan best for your kitten. What you feed your kitten is the most important decision you make each day. Be thorough, thoughtful and feed your kitten the best food you can. Don’t fall prey to savvy marketing and gimmicks. Advances in the science of nutrition occur frequently; yesterday’s hot trend may be today’s flop. Be open-minded and accept that what worked for your other cats may not be best for your new kitten. “Food bowl bullies” is the term I use for cats that intimidate or threaten others at dinnertime in multi-cat households. The food bowl bully is often overweight, while the remaining cats are thin. Guardians often never see the bullying; it’s almost imperceptible and once the pattern is established, the other cats simply stop challenging the dominant cat. Bullying often begins with a shared food bowl. Communal feeding is convenient for us but can create mealtime tension and competition for cats. The key is to provide separate, small food bowls for each cat. I recommend separating the bowls by at least two feet to lessen the impact of any menacing stares. Even better, feed some cats on an elevated surface and don’t hesitate to rotate feeding locations. Contrary to popular belief, cats can be taught to eat at specific times in individual bowls. I’ve been an advocate for separate and distinct cat feedings for over 25 years. As I tracked the pet obesity epidemic during this time, I also saw the rise of food bowl bullies. I found that separate and distinct feedings helped with the bully problem. In the next section, I will discuss feeding frequency. Of course, if you’ve been providing an all-day buffet for years, the older cats may resist at first. You may have to endure some pestering and complaints for two to three weeks before the new routine kicks in. It’s essential to provide adequate calories and optimal nutrition for growing kittens. This doesn’t mean you feed them until they’re fat. Your veterinarian will guide you on calories and food quantity as your kitty develops during the first year. Many cat guardians try to rely on pet-food, feeding guides. That’s a great start, but those are only suggested amounts based on averages. Your goal should be to feed to your kitten’s individual and unique needs. Your new kitten isn’t “average,” don’t feed her as such. I’m a fan of frequent feedings for cats. Two to four times a day works for most families. Think of dividing the day’s calories into breakfast, lunch (or a meal as soon as you return home), dinner and a final meal just before you retire for the evening. These meals are smaller and most cats will finish their food within a few minutes. If you’re transitioning an older cat to the new schedule, you may have to pick up unfinished food after ten or fifteen minutes. Cats that have been bullied may also shrink away, falling into old habits of letting the dominant cat finish before they eat. It doesn’t take long for them to learn the new system is safer and allows them to eat more comfortably. Cats tend to be crepuscular or more active from dusk to dawn. Frequent, small meals and a “midnight snack” help tap into your kitten’s inner predator—and reduce 3 a.m. wake-up kitty calls. Each kitten is precious. What and how you choose to feed it is the biggest factor in how long and well it lives. Take time to analyze your feline feeding habits and start your kitten on a lifelong journey of health, beginning at the food bowl. Now, click here to learn advanced feeding tips to keep your growing kitten eating healthy.